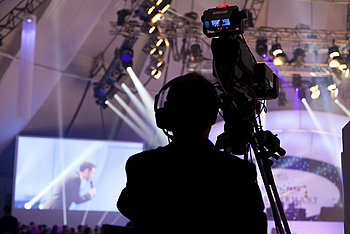 You are looking for the right partner in the field of video and event equipment? No matter whether you only want to rent our modern high-end equipment (Dry Hire), or wish to have the entire service from planning to full implementation of your event- both our rental park and our qualified technicians will meet all your wishes. We have been active in the market since 2003 and kept investing in innovative and advanced technology. 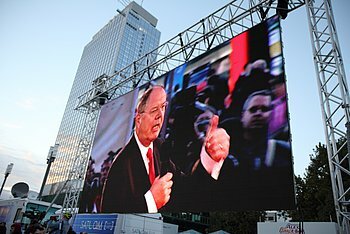 Trust this long existence, our extensive experience in various fields of event activities in Germany, Europe and the world. A few examples in Projects will get you a first impression of our work. We are especially enthusiastic about the many customers who have entrusted us for years with the support of their projects and we feel confirmed over and over again. Neuland GmbH & Co.KG in Eichenzell/Germany – has been renowned for its pin boards, flipcharts and intelligent presentation accessories for over 30 years – basically needs no further introduction. 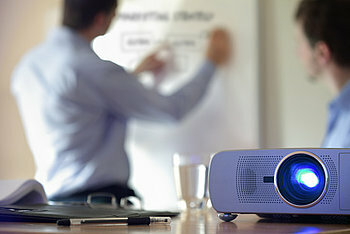 The premium quality and the outstanding reputation of Neuland’s extensive product range is well known to everyone dealing with conferences, meetings and media. 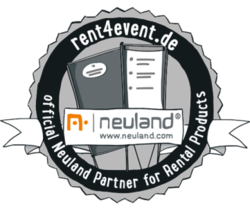 We at rent4event are therefore all the more pleased to be the official Neuland partner for rental products since 1st January 2017. While Neuland in Eichenzell would like to focus more intensely on the development and the design of innovative ideas, as of now, we are in a position to convince you of the familiar and reliable Neuland service by maintaining stable prices for all Neuland rental products. 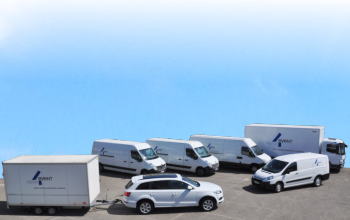 The entire Neuland rental park has been taken over by us, therefore: from small to very large quantities, we are looking forward to your enquiry. You will find more detailed information here. Your will markably upgrade your event visually with a large screen, a pin sharp image produced by the latest projector and camera technology as well as by sophisticated broadcast technology. Professional fading, insertions or clips will also provide an effective visual experience up to the very back rows of the audience. But our task isn't always limited to the pure representation of image and video material or to the live recording, but can also seamlessly become an element of the stage. Thus, a very modern atmosphere can be generated, for example, by a LED element design which is adapted to the remaining stage setting. Video elements do not always have to meet a specific, meaningful purpose, but can of course also act as decorative design elements. 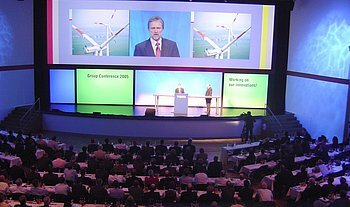 This approach is common at trade fairs, however, is also quite possible on conferences, conventions and general meetings. Of course your event can also be recorded, for example for education and training purposes, the live recording can be captured on DVD for "eternity" or can be broadcasted as a live streaming on the internet to all or only those who are supposed to see it. Here two facts meet: On the one hand there are major events with several thousands of spectators. Open air festivals usually involve even several tens of thousands of spectators. On the other hand, it is quite essential to every single guest to have a good view, to see the star live once in a lifetime and to finally be at the show that has been talked about so much. And last but not least, of course, the show should simply have a great and impressive effect. Surely, large screens and powerful projectors should be indispensible here. Or do you rather prefer a LED wall for an optimal image and fabulous video and lighting effects? The Musion EYELINER on stage or in front of the stage will definitely provide an unforgettable hologramme experience- for most spectators certainly for the first time. For example, the Gorillaz as a virtually animated band "stood" on stage at the MTV Awards together with the real Madonna thanks of the Musion EYELINER hologramme effect. It was also mythical when the hologram of post-mortem Tupac appeared live on stage, together with Eminem and Dr. Dre. 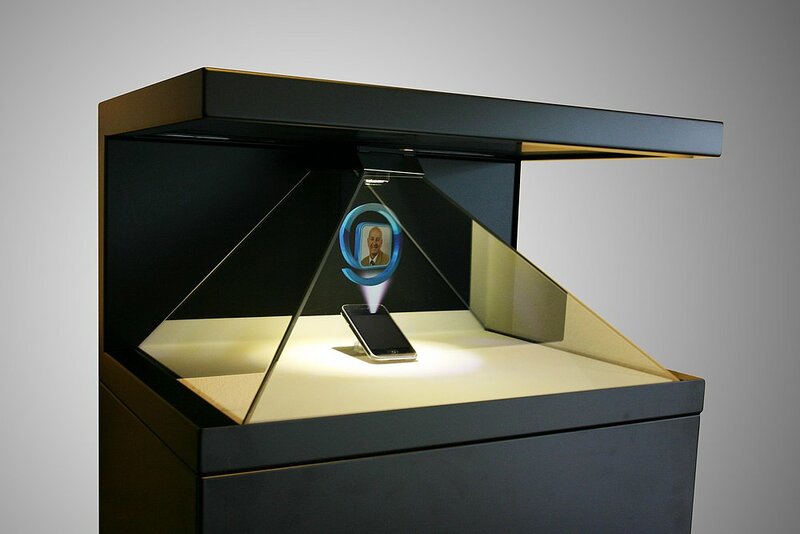 The rap musician's hologram was created from archive material in 1996. Reunited alive for a moment- thanks to Musion EYELINER. Mapping also provides incredible, indelible impressions according to the venue, for which it will be a pleasure for us to take over the Content Production, just as for all other video elements. Trade fairs are as individual as your service and your products are. Therefore the design of your booth should be just as individual. Limits are hardly set to imagination and possibilities. To give an example, by using LED technology your fair booth will prove to be a visitor attraction, because the single elements don't always have to appear exclusively in rectangular shapes. Stripes, circles, ovals, letters, bends,... much can be done. And no matter whether you want to show films with expressive content or rather effective light animations- with LED walls you are always the winner. An absolute fair highlight and the ultimate eye-catcher is Dreamoc, available in different sizes. 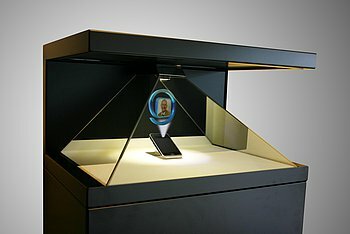 A very stylish, pyramid-shaped glass „showcase“ in which your product moves as a virtual animated 3D object freely in space. As in the example shown on the left, a combination of a real object and animated hologramme is also possible. Every visitor will be stopping at your stunning fair booth. Of course these are all just examples of the many design and combination possibilities which can be generated with the various video elements. 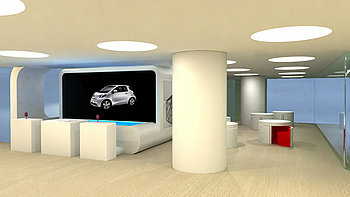 It will be a pleasure for us to help you develop innovative ideas for your next trade fair appearance. 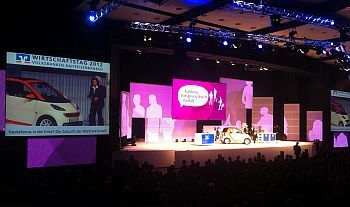 While the guest has to come to the fair, the road show comes to the guest, such as in an election campaign, a car presentation and the like. During a road show tour, which takes place in many different cities (or even countries), no two venues are the same. Some have more room available, others have less, sometimes there are more guests, sometimes there are fewer, and indoor events alternate with partly rainy outdoor events. Here it is important to be able to adapt perfectly to every local condition without ifs and buts. Depending on the product or service and on the scope and size of the venues for your road show, pretty much every element from the video sector can be used effectively. We look forward to your ideas or will be happy to assist you in developping them. Meetings and conferences strongly differ in scope and needs. We provide flip charts and pin boards in the range from small to large-scale for rather small meetings in a hotel, but we also offer the entire technology of a largely invested, locally boundless conference. Again, the use of modern video technology is becoming increasingly important. How about a live streaming of your meetings with colleagues from subsidiaries? Or should it rather become a bidirectional, transatlantic video conference? Or would you even like to present the latest balance sheets in a webcast via embedded power point charts to your employees around the globe? Everything is possible. Your request wasn't listed in here? No problem. Get in contact with us and we will surely find a way together to make your video wishes come true! We look forward to your phone call or email!